These CSS3 features are probably the most popular among developers while add a professional touch. Notice how the other color fades in subtle on hover. When you create gradients the secret is to make them smooth with very similar colors. Hover me to see the effect. Pulsating buttons can be a great way to attract attention. Again, the secret is to make them subtle. 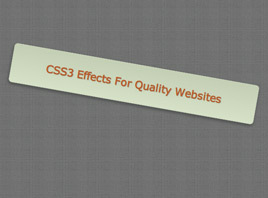 With CSS3 transforms you can create all kind of interesting effects from scaling an element to rotate and move it. These are just few examples of what’s possible with CSS3 and it should give you an idea on how you can make an improved browsing experience for your websites. On the “Hover and Scale” block, add a line with the -ms-transform attribute so it would work on IE9 and above, unfortunately nothing we can do about the older IE except using ugly hacks.